By agreeing to allow the unconditional return of weapons inspectors, Iraq has done well to expose — sadly, not halt — the Bush administration’s unstoppable agenda. This gesture by Iraq was not so much a “stunning turnabout,” but a culmination of a plain and reasonable attempt by an economically desperate Iraq to tie the return of inspectors to the lifting of sanctions. It failed. Washington’s predictably disgruntled response confirms that George W. Bush doesn’t want Saddam Hussein to roll over, but wants, very plainly, to sock it to him. In the process of promising to wage war in the name of cherished American values, President Bush has forgotten a pesky little detail: The U.S. government is beholden to the Constitution, which prohibits the President from declaring war (something he has, to all intents and purposes, already done by ordering bombing sorties over Iraq). It is Congress that declares a war; the President wages it. Rather than go the constitutional route, Mr. Bush began by declaring his commitment to topple the regime in Baghdad, believing somehow that such a prerogative was a policy privilege he commandeered on being elected. The unconstitutional implications of his audacious imperialism never really hit home with Americans. Mr. Bush ended up seeking approval from the United Nations, a body entirely unrepresentative of — even hostile to — the American people. Only now is the President bullying Congress to authorize war against Iraq before November’s midterm elections. At this rate, Congress’s vote will be no more than a formality. 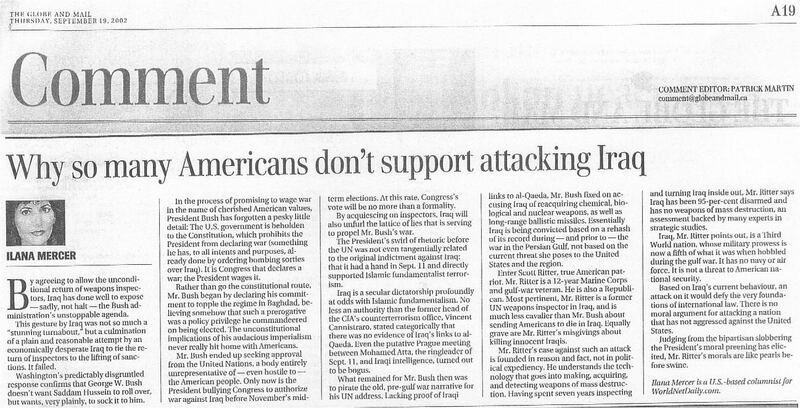 By acquiescing on inspectors, Iraq will also unfurl the lattice of lies that is serving to propel Mr. Bush’s war. The President’s swirl of rhetoric before the UN was not even tangentially related to the original indictment against Iraq: that it had a hand in Sept. 11 and directly supported Islamic fundamentalist terrorism. Iraq is a secular dictatorship profoundly at odds with Islamic fundamentalism. No less an authority than the former head of the CIA’s counterterrorism office, Vincent Cannistraro, stated categorically that there was no evidence of Iraq’s links to al-Qaeda. Even the putative Prague meeting between Mohamed Atta, the ringleader of Sept. 11, and Iraqi intelligence, turned out to be bogus. What remained for Mr. Bush then was to pirate the old, pre-gulf war narrative for his UN address. Lacking proof of Iraqi links to al-Qaeda, Mr. Bush fixed on accusing Iraq of reacquiring chemical, biological and nuclear weapons, as well as long-range ballistic missiles. Essentially Iraq is being convicted based on a rehash of its record during — and prior to — the war in the Persian Gulf, not based on the current threat she poses to the United States and the region. Enter Scott Ritter, true American patriot. Mr. Ritter is a 12-year Marine Corps and gulf-war veteran. He is also a Republican. Most pertinent, Mr. Ritter is a former UN weapons inspector in Iraq, and is much less cavalier than Mr. Bush about sending Americans to die in Iraq. Equally grave are Mr. Ritter’s misgivings about killing innocent Iraqis. Mr. Ritter’s case against such an attack is founded in reason and fact, not in political expediency. He understands the technology that goes into making, acquiring, and detecting weapons of mass destruction. Having spent seven years inspecting and turning Iraq inside out, Mr. Ritter says Iraq has been 95-per-cent disarmed and has no weapons of mass destruction, an assessment backed by many experts in strategic studies. Iraq, Mr. Ritter points out, is a Third World nation, whose military prowess is now a fifth of what it was when hobbled during the gulf war. It has no navy or air force. It is not a threat to American national security. Based on Iraq’s current behaviour, an attack on it would defy the very foundations of international law. There is no moral argument for attacking a nation that has not aggressed against the United States. Judging from the bipartisan slobbering the President’s moral preening has elicited, Mr. Ritter’s morals are like pearls before swine. Ilana Mercer is a U.S.-based columnist for WorldNetDaily.com.